Every February we have the incredible opportunity of showcasing a sampling of our amazing catalog in front of thousands of toy industry professionals at the nation's largest Toy show - Toy Fair NY, held by the Toy Association. Our expertly-designed products may span dozens of categories and age ranges, but they all have one important goal: To encourage learning through play. At HABA, we believe that kids need real, tangible toys made of safe, quality materials. Toys that are simple, durable, colorful and engaging. In addition to products designed at our German headquarters under the HABA label, HABA USA also offers several innovative, European brands to the North American market including: Spielstabil - German-made, indestructible sand and water toys and the newest addition: Hubelino - German-made building bricks and marble run sets that are fully compatible with common systems for interlocking toy blocks. Here is a sneak peek of just a few of the new products we will have on display at Toy Fair this year being held at the Javitz Convention Center in NYC February 16-19, 2019. We're continually expanding this line of cheerful, bendable playmates and this year we're really excited to show off the newest characters: Liam, Lara, Bride and Groom pair, as well as Andreas the Vet Tech and Rebecca who comes included with the Vet Clinic set. There's also a Vet JEEP so the friends can transport their sick animal friends! And what doll collection is complete without a treehouse with hammock, rope ladder and swing? We've also added a few more animal friends into the mix to keep the barn yard stocked and the horse stables full of life! Last year we introduced a game changer in the world of S.T.E.M. play called Kullerbu, which takes our classic ball tracks, enlarges them a bit and adds in thrilling elements like spiral tracks, tall columns to create steep drops, trap doors, and tunnels. The widened track allows for a larger ball which makes the set appropriate for toddlers, yet engaging and expandable for older children. In addition to wooden balls, there are themed cars and trucks that ride the tracks too. Some even have momentum motors that give them the ability to climb up hill! This year’s additions to Kullerbu include a Police Chase set as well as several complementary pieces that enhance existing sets. BabyMusical Character Clutching Toys - Whether it is rattling, clattering or jingling, babies LOVE to make noise! With our new musical character grasping toys, little ones can do just that! These bright and cheery friends boast beech wood faces and grippy plastic for the perfect combination of function and durability, not to mention of course safety! Rod Clutching Toys - If rattling or rolling is more your little one’s style, our new trio of Rod Clutching toys made of beechwood are sure to shake those sillies out! Baby Photo Album Playmates - A photo album built for babies to enjoy, how clever! Now just like Mom and Dad, little one can keep their precious memories and loved ones close by with our Baby Photo Albums. Chewable, gnawable and designed to withstand even the toughest drool! Each holds up to eight, 4x6 photos. Snug Up Dolls - Role playing is so essential to a child’s emotional development! Our cuddly new plush Snug Up dolls Roya, Edda and Dorthea make great ‘first dolls’ for toddlers 18 months and up. Featuring built in clothing and darling, tangle-free hair styles. They’re even machine washable! What about taking your dolls on the go? We've got you covered with our newest accessory - The Doll Bike Seat, which allows your little one to take their HABA doll with them on the bike, scooter and even a sled! HABA has come to be known as the gold standard for children’s games. Each year, both the toy and board game industries anticipate exciting new game releases in yellow box form and 2019 does not disappoint! Snail Sprint - Racing snails may not be something one would ever expect to see, but in this new one players are doing just that! Lucky dice rolls and skillful moves will get your snails to the podium to receive the most points and win! Snail Sprint uses color matching and dice, and even utlizes the magnetic tin as part of the game! Luxantis, is an exciting cooperative game for 2-4 players ages 6+. The shadow creatures are determined to capture Luxantis Castle. They can only be stopped with the help of enchanted objects found within the magic light forest labyrinth. Together, players need to light up the labyrinth and must remember the arrangement of the lights, since only the spaces that light up 'blue' are safe. Players reach a strategic, yet cooperative agreement to search for the objects and try to avoid the dangerous red ghost lights. Each round of the game can take an unexpected turn due to the interactive LED game board and unpredictable die rolls! Honga is a strategy game that incorporates worker placement and resource management. It is simple enough for beginners to grasp, yet holds enough depth for experience gamers as well, making it ideal for kids and parents of all abilities to enjoy together. Players are competing by tackling various tasks: gathering supplies, combing through the dark forest, paying homage to the nature gods, attracting mammoths, and successfully executing barters with other clans. But watch out - the saber-toothed tiger Honga needs to be fed too! Players must use their resources wisely and efficiently to collect the most victory points. Block & Tackle - What goes up, must come down! With our new Terra Kids Block & Tackle pulley system, kids can experience and understand physics through play both indoors and out - perfect for little tinkerers! Tent Light - What a handy gadget for little adventurers! Whether they’re camping out this winter in their play fort or exploring outside at dusk, this compact light is just what they need to be safe and prepared for anything! The lamp can be slightly dimmed for reading and the blinking feature is great for drawing attention to oneself. Carabiner allows easy attachment to tent, camper, treehouse roof or even to belt loop or backpack! Also on display at Toy Fair is our new exclusive line of affordable and developmentally appropriate STEM toys that fuse the renowned educational and developmental expertise of both the HABA and Highlights for Children brands. We are incredibly proud of this license partnership with Highlights for Children Inc. -- an iconic American media brand whose “Highlights for Children” magazine has been an educational staple in households, libraries and schools for over 70 years. 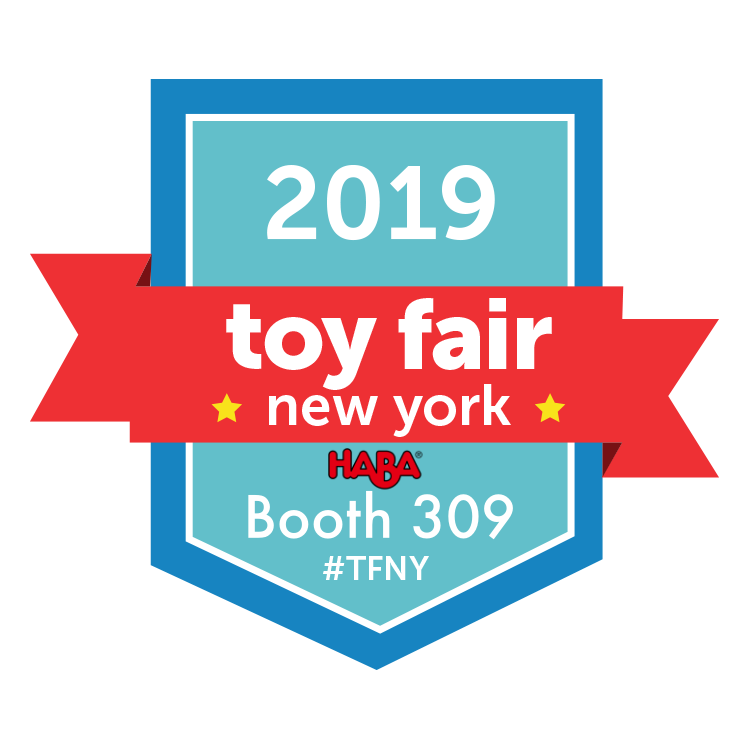 If you're a retail store owner, buyer, rep, influencer or member of the media, be sure to stop and visit HABA USA this year at NY Toy Fair in Booth #309!